Burger King adds a second cereal shake to the menu with the introduction of the new, limited-time Lucky Charms Shake. 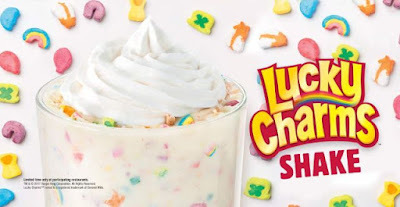 Following in the footsteps of the Froot Loops Shake, the new shakes features Lucky Charms cereal blended with marshmallow cereal-flavored syrup and vanilla soft serve, garnished with whipped topping. Both Froot Loops and Lucky Charms are among the top ten best-selling cereals in the US. The suggested price for the new shake is $2.99 (May vary. It goes for $3.59 at my local Burger King). If they're going to continue putting out cereal shakes, my vote is for Golden Grahams.